I remember the first time I attempted to make an American style Thanksgiving for my family. It was a big deal for me because all the previous Thanksgiving preparations were done by my mom. When I told her I was going to plan the menu and prepare it, she kindly stepped out of the kitchen and let me do my thing. Wonderful! Now where do I start? Me: "Let's see - on my shopping list I have Stove Top Stuffing, mashed potato flakes, a couple jars of gravy..."
Heather: "What?! That's not Thanksgiving! You can do better than that!" Behold - Heather schooled me on real home cooked Thanksgiving fare, which did not consist of the pre-packaged 'nonsense' I had originally planned to go with. Needless to say, my shopping list was scrapped and Heather shared with me how her family prepared their Thanksgiving meal, along with recipes! Fast forward decades later, I'm sure Heather would be pretty proud of me. She's since passed on but I know she's smiling from above knowing I can now make stuffing, mashed potatoes and even gravy from scratch! 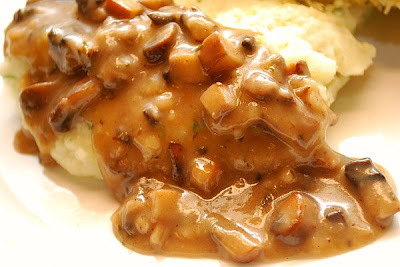 This is a pretty flavorful gravy made with cremini mushrooms and a touch of marsala wine. It's fantastic over garlic mashed potatoes, which I made for tonight's dinner. The gravy pairs nicely with chicken or even pork! Melt the butter in a skillet over medium-high heat. Add the mushrooms and cook, stirring occasionally, about 8 minutes. Season mushrooms with salt and pepper to taste. Scatter the flour over the mushrooms and stir until lightly browned, about 1 minute. Add the dried thyme, marsala and broth and bring to a boil, cooking until thickened, about 2 minutes. Season with salt and pepper and serve over your favorite mashed potatoes recipe or with chicken or pork! Remember when I made that full Thanksgiving meal from scratch here in England for my in-laws? Never again! It was so much hard work! Its a lot of effort, but it really does feel like an authentic thanksgiving when you do it all from scratch. This sounds so good! Can't wait to try it! This gravy looks so good. I am going to try it with chicken for sure. 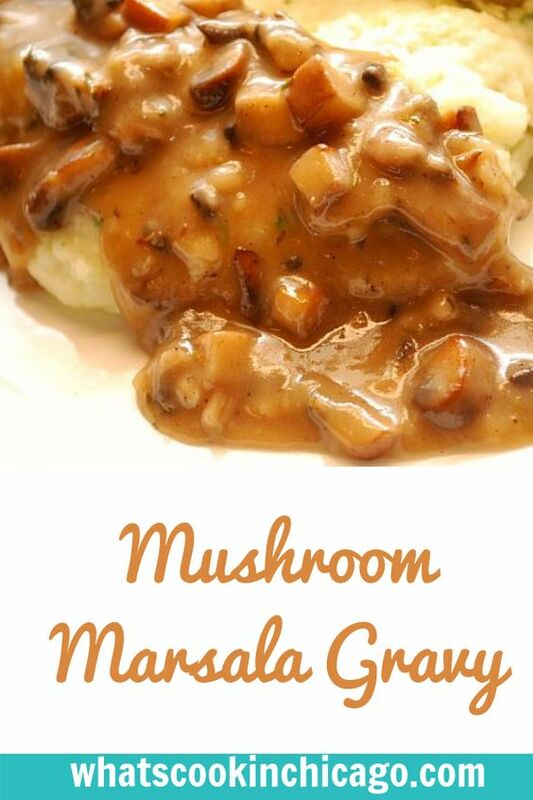 I have been looking for a good gravy and I think this might just be it. Thanks.